KAROUN Ackawi cheese all natural Mediterranean Karoun cheese is the real Middle Eastern cheese denoting Aka, the historical region in the Middle East where this cheese originated. Ackawi is one of the varied Karoun Dairies Karoun brand Middle Eastern specialty dairy foods. 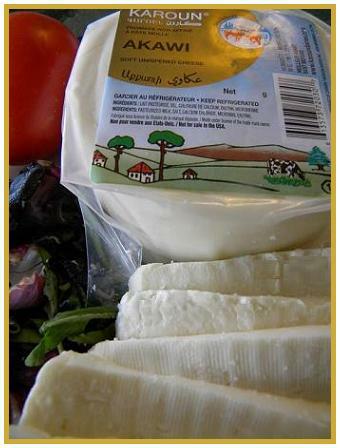 Karoun brand cheeses are now produced in Canada following centuries old Middle Eastern traditions. KAROUN DAIRIES INC. all natural specialty artisan cheeses are under the constant supervision of KAROUN DAIRIES SAL, and distributed by KAROUN DAIRIES INC. Canadian Middle East specialty cheese Company. KAROUN authentic Ackawi cheese is a pure and natural soft unripened white cheese. It is salty as most Mideastern specialty cheeses. KAROUN Ackawi cheese is suitable as a table cheese, in sandwiches, or paired with fruits. Pasteurized Milk, Salt, Calcium Chloride, Microbial Enzyme. Shelf Life: 4 months refrigerated 20-70 C.